Since the start of January of 2017, Nompumelelo Ndaba has been working as an intern with Asiye eTafuleni (AeT), a Non-Profit Organisation, situated by the heart of the busy and bustling Warwick Junction. 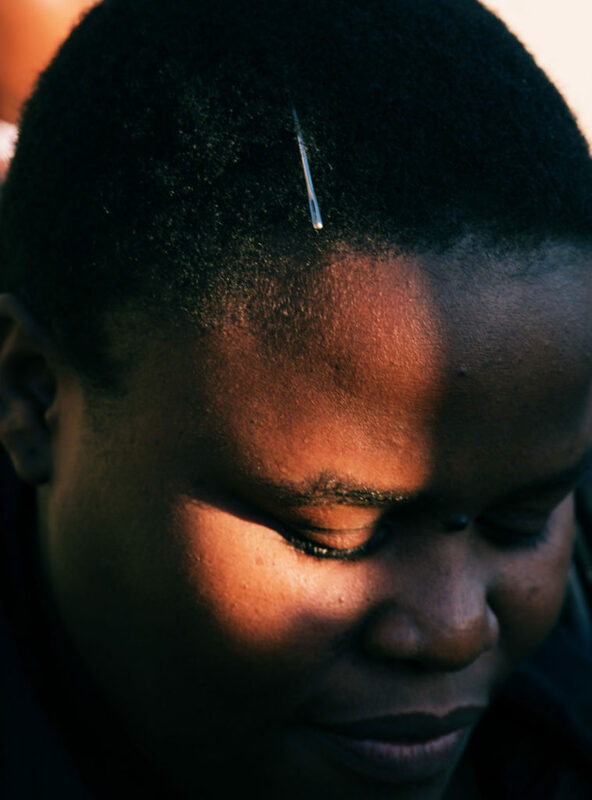 The twenty-four-year-old leads a hectic life, juggling her internship, making the traditional Zulu hats, “izinhloko” — which she then sells at the Warwick Bead Market — whilst studying to become a teacher, and caring for her siblings. Mpumeh and her sister Thandeka. Photo: Kristine Rød. By the side of the road of the bustling Joseph Nduli Street, where the taxies are flying by and the sounds from all parts of the Warwick Junction are waking up from the dark, Nompumelelo — or Mpumeh for short — and her sister Thandeka arrives as early as 5am in the morning. “I know most of the people around here. Many of them are neighbours, and we look out for each other”. 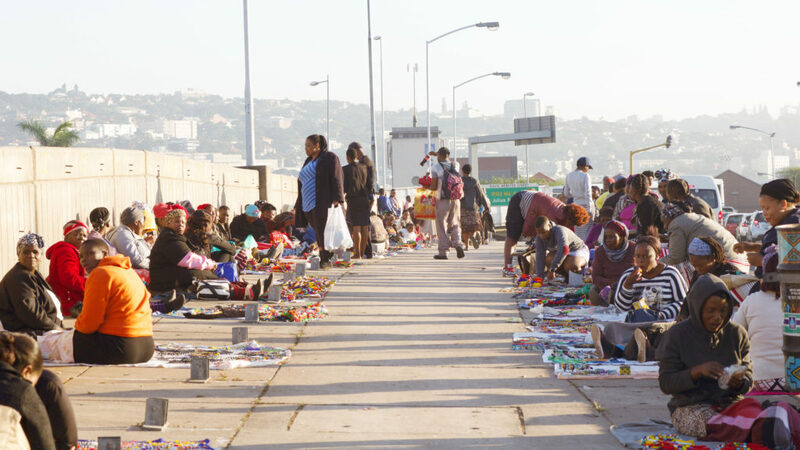 While most people are still sound asleep around Durban and as the sun is rising over the coastal city, Mpumeh sets up everything while more and more traders are joining her on the sidewalk (the temporary location for the Bead Market while their facility is being upgraded). 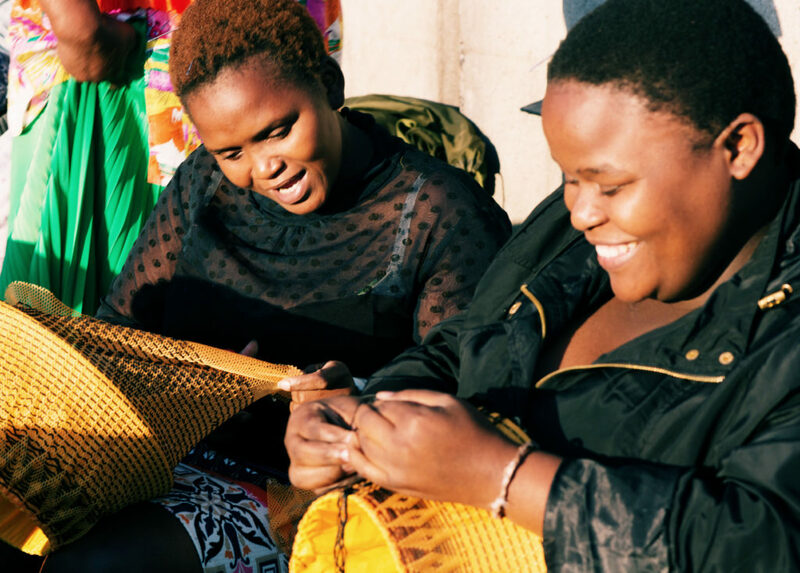 All around one can see beautiful beadwork in the form of bracelets, necklaces and earrings — to name a few — but for Mpumeh, her speciality are the hats. “They were worn only by married (Zulu) women, back in the day. But now, its more a fashion trend”, Mpumeh says and adds laughingly: “Everybody can wear them, except for men”. Mpumeh and Thandeka’s current trading spot in the temporary location of the Bead Market. Photo: Kristine Rød. Stacked like a wall in front of her, the hats shine bright with their manifold of colours and patterns. With a needle pinned to her hair, which she uses to make the hats, the twenty-four-year-old stitches up a last couple of details on a brand new creation. Mpumeh informs us that the she makes all sorts of patterns and colours for different customers, depending on what people are looking for, but the “rastafari” edition seems to be the most popular. The black, yellow, green and red. Although Mpumeh is still young, she is somewhat of a seasoned veteran and has been working actively with her business for the last seven years, ever since she finished school. “My mom taught me this trade from around the age of 11. After she passed away in 2007, my sister and I started making the hats”. Mpumeh’s pin cushion. Photo: Kristine Rød. And now hat making is a full week’s work. Mpumeh starts her production line every Saturday afternoon and works through the week in her spare time, sometimes even through the night, leading up to Friday, which is the day she joins the market every week. 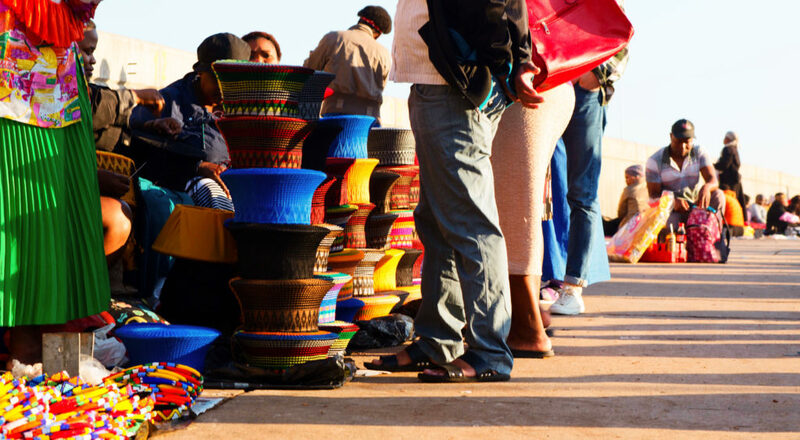 “Each hat costs between R20-R40, and on an average Friday I sell between 5-10 hats, and during the peak seasons which is around September to December, I sell up to 20-30 hats which is a really good day. But it all depends on how many I have made that week”. The hat making process. Photo: Kristine Rød. So far there has not been any sales, but the day is still young and full of potential. The markets of Warwick itself provides a great many possibilities for enthusiastic entrepreneurs like Mpumeh, and she says she is very happy to be able to provide for herself. But the job is not without challenges. “Right now we don’t have a proper facility or a shelter, and sometimes it will rain and the stuff will get spoiled, Mpumeh says. And when it’s not raining the blazing hot sun can be a quite a big issue”. The temporary location of the Bead Market along Joseph Nduli Street. Photo: Kristine Rød. During regular office hours, Mpumeh finds herself at AeT, assisting with administrative tasks and helping out with organising the popular Markets of Warwick tour. She will be staying with AeT as an intern until the end of the year, by which time she aims to finish her teaching degree. And although she hopes for her business to keep growing, it will eventually mean moving on from her job at Warwick Junction. “It would be nice, to sell more hats. 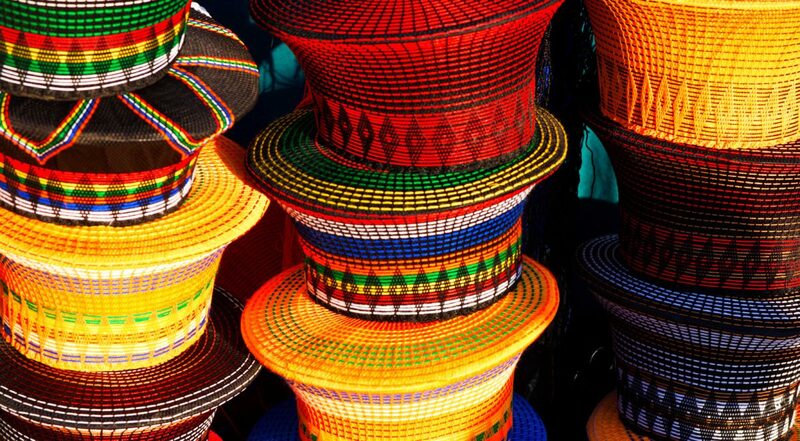 But I am hoping that I won’t have to sell hats in the future”, Mpumeh says. A customer trying on a hat. Photo: Kristine Rød. So where the multi-talented young woman will find herself in the next couple of years — maybe at one of Durban’s schools — is not certain. 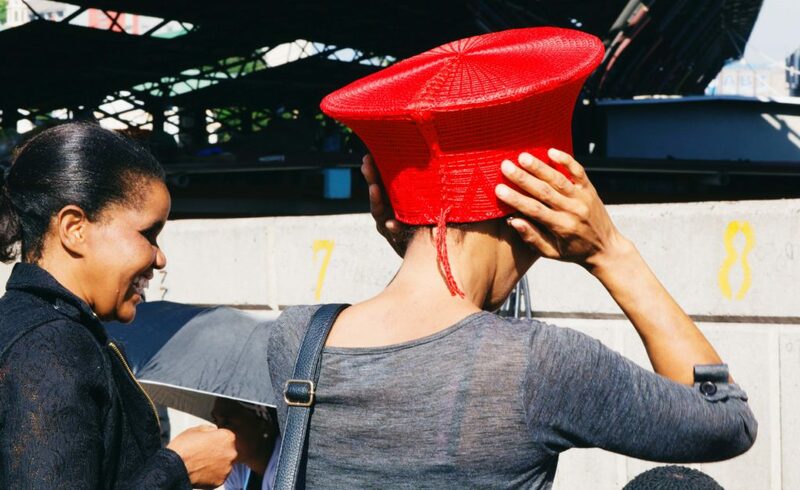 But for the time being she can be found at the markets of Warwick, designing and creating new hats, exemplifying the multitude of talent and entrepreneurship the Warwick markets has to offer.